MDC-T leader, Morgan Tsvangirai, says the continued victimization of constitutionally elected councillors by local Government minister, Saviour Kasukuwere, was a sign that â€˜rule by manâ€™ was gaining ground against the rule of law. Tsvangirai said Kasukuwere was deliberately victimizing MDC-T councillors through suspensions, adding the minister’s actions were unconstitutional. The MDC-T leader added that Kasukuwere’s continued violation of the constitution was affecting service delivery in the local authorities the minister was targeting. He said, in doing so, Kasukuwere was not serving the interests of the nation but that of his party (Zanu PF). â€œWhat Kasukuwere is doing in targeting MDC-T run urban councils is not in the interest of the people; it is in the interest of his party and he is not serving the nation at all,â€ said Tsvangirai at the weekend. Tsvangirai was addressing mourners at the burial of the late Gweru deputy mayor, Artwell Matyorauta, in the Midlands capital. 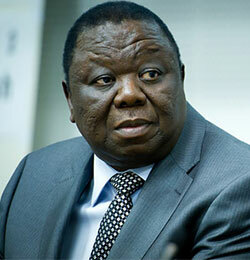 â€œWhen people violate the constitution there is no longer rule of the law but rule by man,â€Tsvangirai said. The MDC-T was, last week, forced to file an urgent High Court application seeking an order to reverse the suspension of Manyenyeni. In suspending the Harare Mayor, Kasukuwere claimed that Manyenyeni acted illegally by hiring a new Town Clerk whom the minister did not favour.